Not yet 10 years old in 1970, the two daughters of Ruben Salazar weren’t aware that their father was one of the country’s most prominent Latinos. But they knew he wrote for a newspaper, the Los Angeles Times, and that he worked long hours because they usually ate dinner before he got home. They remember that he wore business suits, and that he had pale skin and long eyelashes, and that he delighted in taking them, their little brother, and mother to Disneyland and Balboa Island. They lived in a newly built track house in Santa Ana, when the city was predominantly white–along with the rest of Orange County. Nearby were marshes and a sprinkling of strawberry fields and, less than two miles away, the lima bean fields from which the already impressive South Coast Plaza had begun to sprout. Salazar, a Times columnist and news director of pioneering Spanish-language KMEX-TV, was covering the National Chicano Moratorium Against the Vietnam War, a protest in East Los Angeles on August 29, 1970. The gathering estimated at 30,000 people turned violent when police aggressively went into the crowds. As the unrest continued, Salazar and a KMEX colleague ducked into the Silver Dollar Bar on Whittier Boulevard–many blocks from the event’s epicenter–to use the restroom and have a beer. A bystander erroneously reported seeing a man with a gun enter the Silver Dollar, and Salazar was sitting at the bar when a tear-gas canister fired by a Los Angeles County sheriff’s deputy hurtled through the closed curtains at the entrance. It passed through the back of Salazar’s skull, killing him instantly. He was 42. The riot claimed two other lives, resulted in more than 60 injuries, and led to about 200 arrests and property damage in excess of $1 million. But Salazar’s mysterious and troubling death dominated the headlines, making him an enduring symbol of the mayhem. A new PBS documentary, “Ruben Salazar: Man in the Middle,” which airs nationally on April 29, is the most comprehensive look to date, at his life, times and legend. Drawing from family archives–including Salazar’s personal journal–and revelations from long-suppressed law enforcement files, the one-hour program provides missing pieces within the context of agitated times. Salazar believed he was being watched by law enforcement because of his unapologetic coverage of police tactics in the Mexican-American community. The day he died he told a coworker he thought he was being followed. There was a much-publicized 16-day inquest, which produced 2,025 pages of testimony from more than 60 witnesses, and 24 exhibits. When it was over, Salazar’s death was deemed an accident. No criminal charges were ever filed. But the case wouldn’t go away. With the files off-limits to the press and public, conspiracy theories swirled. 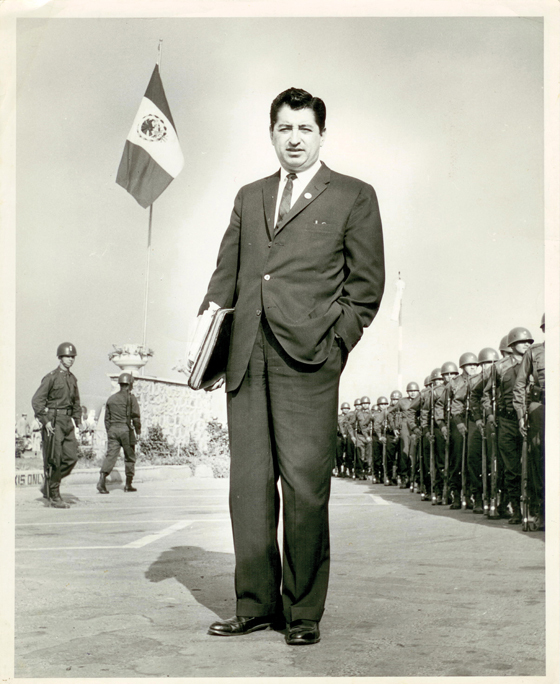 All the while, Ruben Salazar’s name became synonymous with the struggle of La Raza. His ensuing martyrdom led to myriad tributes. The 8.4 acre park where the moratorium took place today is known as Ruben F. Salazar Park. There are namesake community centers and schools. A 2008 stamp from the U.S. Postal Service commemorates his work as a journalist, as do scholarship programs. Artists and entertainers have embellished Salazar’s folk hero status. He has a saint-like demeanor in the lithograph “Heroic Voice,” by Mexican artist-muralist David Alfaro Siqueiros. A corrido by acclaimed guitarist-singer Lalo Guerrero laments his fate. In the theater production“Cesar & Ruben,”written by Ed Begley Jr., Salazar has a fictional encounter, set to song, with labor activist Cesar Chavez. Another play, “The Silver Dollar,” once was restaged at the bar where Salazar was killed. Noted writers have had their say. Hunter S. Thompson checked into a dumpy hotel just down from the Silver Dollar, where one of his sources (and drinking buddies) was Mexican-American activist and attorney Oscar Zeta Acosta. The resulting 1971 Rolling Stone article, “Strange Rumblings in Aztlan,” is considered a classic. Born in Mexico and raised in El Paso, Texas, Salazar had worked for the Times as a foreign correspondent in the Dominican Republic and Vietnam, and later became the newspaper’s bureau chief in Mexico City. Then came a reassignment: Los Angeles needed someone to cover the burgeoning Chicano movement. The paper would later applaud Salazar as “an early and eloquent explorer of the Mexican-American experience [who] wrote from the ground up.” He continued as a Times columnist when he went to work for KMEX, where he intensified his coverage of the Chicano scene shaking up Los Angeles. According to some colleagues, he was beginning to empathize as well as investigate. The documentary explores Salazar’s conflicts–and his parallel professional and personal lives. Rodriguez, who spent years making the documentary, and co-producer Jennifer Craig-Kobzik partnered with the Mexican American Legal Defense and Educational Fund to get the Sheriff’s Department to open the case files. “Ruben’s story was mired in so much mystery and conspiracy thinking, it could never before be told with any kind of historicity,” Rodriguez says. When the files were made available in 2011, Rodriguez and the Salazars found details they hadn’t known, and photos they’d never seen–including disturbing crime-scene images–but no concrete evidence of a conspiracy, large or small. Among those who went on camera to tell the story: former Deputy Tom Wilson, who fired the tear-gas canister. The documentary concludes that Salazar, who is buried in Corona del Mar’s Pacific View Memorial Park, died because of a tragic mistake. “Conspiracy theories are very alluring. But finally, ultimately, you’re looking for resolution,” says Rodriguez. A new TV documentary explores the remarkable life and controversial death of journalist Ruben Salazar.